Annie Clougherty, Mark’s Realtor and proud owner of industry-leading, Annie Clougherty Real Estate in Newport Beach CA, proudly took on the wide-ranging and steadfast search, determined to find just the right real estate property as she always does for all of her highly-valued clients and friends. After an exhaustive 6-month search, Annie’s expert eye and uncanny knack for seeing untapped Southern California real estate potential found the 1980’s style house. Then it was Tracy, Mark’s fiancé and co-worker, who agreed with Annie’s expert vision of potential and convinced Mark it was a good find to pursue. With full trust placed in Annie, the couple dove right in, all the while dreaming of their “Zen Home.” They wanted, as Tracy put it, ‘A place that at the end of the day would make it feel like one could take a big deep breath when entering.’ It was with this real estate goal in mind, the framework for the redesign into their dream home began to take shape. They began planning and imagining all that they could do with the home, using the budget they allotted themselves. 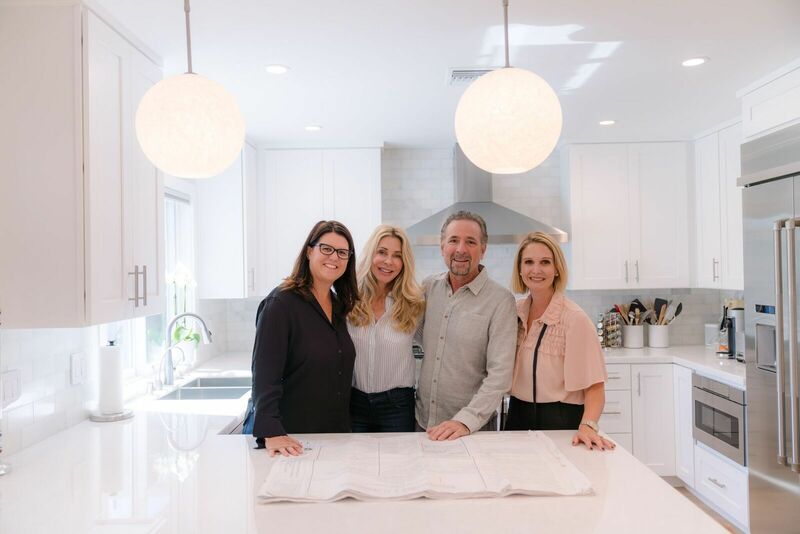 With all ideas they had for the property, it would take a team of highly-experienced, trustworthy experts to plan, organize, and execute each and every last detail of the Newport Beach-remodel. Being the highly-respected and trustworthy real estate agent she is, Annie tapped her professional network and provided a list of her most trusted construction companies with work examples and the couple confidently decided on Erin Kennedy, and the experienced team from ATP (All Things Possible) Builders. ATP Builders went right to work, first by establishing a partnership and taking the time to thoroughly understand the main and most important Zen remodel goals of their new clients while staying within the budget they had to work with. After several brainstorming sessions, ATP drafted and presented 3 separate plans with corresponding budgets for the couple to pour over and peruse. After meticulously going over their plans with the excited couple, final decisions were made, and ground was broken on their 6-month, property-enhancing project. Once the trusting partnership with her clients Mark and Tracy was forged, Annie proudly passed the reigns to ATP Builders who remained steadfast and disciplined through each decision in the process to trim all the edges in order to hit the very top priorities while staying within the couple’s budget. As the project continued, Mark and Tracy were delighted at the professionalism and efficiency of the team working on their home adding the second story, opening up the main living space, and extending the property to include a stellar master retreat. ATP embodied the business principle of doing right by their client, in accordance with their priorities and budget, all while under the experienced and watchful eye of ATP Builder’s President, Erin Kennedy. Annie Clougherty Real Estate, with Compass Real Estate in Newport Beach, is the living embodiment of humble, helpful, and reliable local real estate knowledge and expertise. Add to this the affectionately personal, and relentlessly professional touch that only Annie can bring to any real estate transaction and remodel project. To Annie, her work goes far beyond finding homes for her clients, it a personal pursuit to provide the very highest quality service and expert guidance, while working tirelessly for her clients every step of the way. Mark and Tracy’s full trust placed in Annie’s hands have been handsomely rewarded in their new dream, Zen home. For this, they will be forever grateful.